The world is running fast. In order to maintain pace with such a fast moving world, each individual existing in this competitive world too need to run. While the individuals run to make their identity in this competitive world, such individuals have competition from other individual. In order to prove themselves better, they need to undergo competitive examinations either for seeking a job or to seek admission into a course of study. Most of the times, these competitive examinations strives to understand the critical thinking abilities and the subject knowledge of the candidates. In order to make these competitive examinations crisper, time saver, and a little confusing as well as easier to assess, the agencies opt for Multiple Choice Questions. 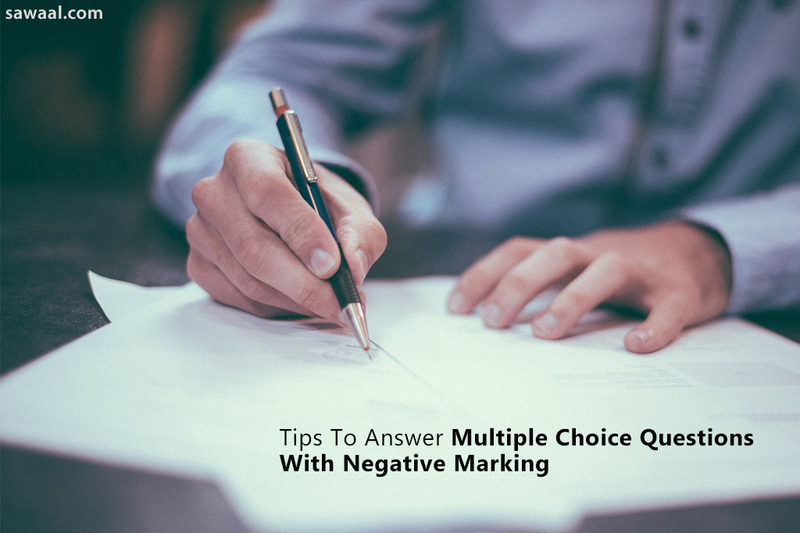 While there are many forums which discuss on the methods which should be adopted to attempt such a Multiple Choice Question based paper, it is important to factor in the component of negative marking associated with such multiple choice questions. The students would, thus, require tips to answer multiple choice questions with negative marking. Barring a few competitive examinations, the students need to deal with the component of negative marking in majority of such examinations. Such negative marking schemes are usually one of the techniques for eliminating candidates. The word Negative marking indicates that the marks that the student obtains in the examination would be deducted for each wrong answer provided by the candidate. Most of the times, wrong answers attract a negative marking of ¼ of a number and this can extend up to making the student lose 1 mark for each wrong answer or even more. Taking the example of ¼ of a number deduction for each wrong answer, the student would lose a complete mark for four wrong answers. Such a mark might be crucial enough to make the difference between passing and failing the examination. Students should thus attempt to answer multiple choice questions correctly and follow the tips mentioned below to answer the multiple choice questions without attracting negative marks or at least reduce the same to a large extent. 2. A golden rule when the candidate is not sure of the answer and is making a calculated risk on choosing the first option, he or she should be ensure that the last option is not “all of the above”. Multiple choice questions with such an option should be dealt with extra caution. 3. The golden rule followed for an option of “all of the above” should also be followed for the questions with an option of “none of the above.” Apply extra caution in selecting the options in such questions. These can be tricky choices. 4. In questions where the candidate is sure about the answer, it is advisable to read each option carefully. The golden rule which can be followed here is to eliminate each option in order to be doubly sure about the option which the candidate selects, thus eliminating any possibility of getting the answer wrong. The candidate should also be sure about choosing the best possible answer rather than selecting the right answer which emphasizes on being wise enough in choosing the option. 5. In case the candidate gets confused about any question or even between more than one options the golden rule is to skip the question and move forward. The question can be revisited in sometime. This might help in removing the confusion and selecting the best possible answer. 6. In case the candidate believes that he/she has some or at least a little idea about the topic and subject of the question, then it is advisable to at least attempt the question in a logical manner based on his or her understanding. The candidate should ideally try to imagine and answer the question logically without looking at the options in the very first case. This would help him/her to be a little more assured about the answer. 7. In case the candidate faces a dilemma between a knowledge based answer and a gut based answer, it is advisable to always go with the knowledge based answer rather than going with the gut based answer since gut may or may not go wrong but knowledge will never go wrong. 8. While answering the negatively worded questions, it is always advisable to try the True and False method since that would give a definitive picture of the question and allow the candidate to answer the same correctly. 9. While attempting to answer multiple choice questions, the candidates should analyze the questions well and convince him/her about the answers much before marking the actual answer on the sheet. This would prevent him/her from making double writing or make multiple choices. 10. The final golden tip about attempting multiple choice question is the wisest one. Researches prove that the very first guess about the answer of a particular question is found to be correct in most of the cases. Therefore go with the first guess and first gut feeling. While it is always advisable to attempt a multiple choice question based competitive examination with full preparation, there are situations when the candidate needs to make guesses. These tips to answer multiple choice questions with negative markings come in handy at those times.